If you are currently downloading this mod from a site other than curseforge.com then stop this instant and go download the mod from the proper site! Backups is the ultimate backup mod. It will automatically backup your entire world every 15 minutes (configurable) and stores your backups in a format that takes up very little disk space. You can easily restore a world from ingame with the backups GUI and restore parts of your world with the /restore command (requires cheats). Please post any bugs you find or features you think I should add on the bug tracker. Any private messages to me about this mod will be ignored. 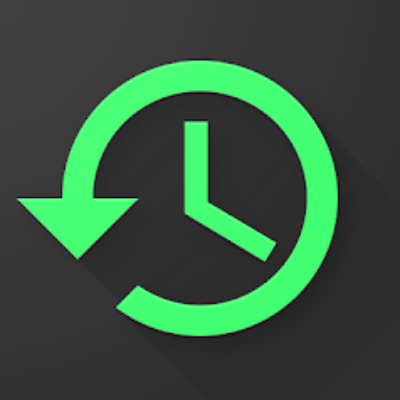 Automatic Backups - Your world is automatically backed up every 15 minutes. You can also start a backup yourself with the /backup command. The automatic backup intreval can be changed in the config file. 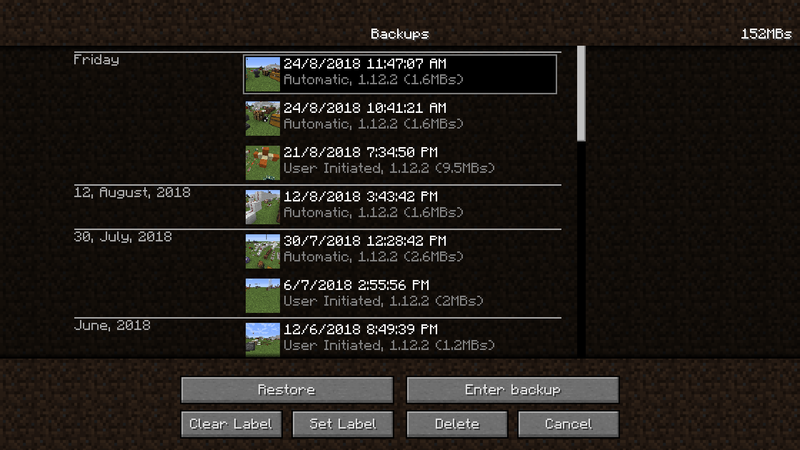 Backups GUI - Clicking on the backups button (which replaces the re-create button, if you hold Alt/Option then the backups button will turn back into the re-create button) when you have a world selected will display the backups GUI, which has a list of all backups for that world. The storage size and reason the backup was created are displayed below each backup, and the total storage size is displayed in the top-right. Restore - Creates a backup of the world and then restores the world from the selected backup. Enter Backup - Loads the selected backup as if it was a world. Anything you do while inside the backup isn't saved. Set Label - Allows you to set a label for the selected backup. Labeled backups won't be trimmed. Clear Label - Clears the label from the selected backup. Delete - Deletes the selected backup. If a backup is older than a hour, only one backup per hour is kept. If a backup is older than three days, only one backup per day is kept. If a backup is older than a month, only one backup per week is kept. Backup trimming can be configured or disabled in the config file. Will restore all blocks from x1 y1 z1 to x2 y2 z2 to backup. The backup can be the number of backups ago, or the date and time for a specific backup. Will restore the inventory of player to backup. The backup can be the number of backups ago, or the date and time for a specific backup. Backup Format - Backups are incremental, which means each backup only contains the data that has changed since the last backup. This greatly decreases the amount of disk space backups take up. Backups are also compressed, which decreases disk size even futher. That will restore the contents of backup dir to world dir. You can not redistribute or rehost this mod, unless you are rehosting this mod as part of a modpack. You can not repost this mod, unless you give credit to me and provide a link to the CurseForge page. You may not provide your own download link. You can not claim you made this mod. You can not use this mod in a way that violates Mojang's EULA which can be found at https://account.mojang.com/documents/minecraft_eula. You can include this mod in modpacks as long as you give credit to me(Silly511) and provide a link back to this page. trying to restore a players inv in server, says: Snapshot/backup restore is not configured"
Also how do i open the GUI in server? That is a conflict between my mod's restore command and world edit's restore command. I'm not sure what you can do about that other than remove world edit. There isn't a backups GUI for servers, that's a client only feature. If you want to view all the backups, look inside the backups directory in your server directory. Hey, just tried to use the restore feature on a server . I believe I followed the syntax correctly but I get the error message "Backup is invalid" . This was entered into command prompt while in the minecraft directory , not the server console. You're pointing it to the backups directory which contains all backups of the server. You need to give it a specific backup. If you look inside C:\Users\admin\minecraft\backups you should see a directory named world, and inside that a directory for every backup. You need to point it to one of those directories. I'm using Open Terrain Generator mod and it changes the World Creation GUI entirely and I can't find the Backups button. Is there an in-game command to restore the latest backup or anyway to use the Backups mod with the Open Terrain generator mod? I love the Backups mode so I would really like it to work with OTG. Should be fixed in version 1.4.4. OMG! YOU ARE A SAINT!!!!! Really love your mod on how easy it is to use and the look of the GUI and everything. Can't believe you fixed it that fast! Thank you so much!!!! Why does this remove the "Re-create" world button? Can we have your mod add another button instead of removing this one? I use the re-create button a lot when testing modpacks and such. If you hold Alt/Option then the backups button will turn back into the re-create button. Kso. That doesn't seem to work for me...is it a keybind? Are you sure you're pressing the right key? Try pressing all the different functions keys and see if any of them work. Yes. I've tried Alt, Shift and Ctrl and none of them work. I haven't tried the right side keys though...guess i'll do that and report back. Are you holding it down or just pressing it once? You need to hold the key down. Yes I'm holding it down. I'm Selecting the world I want to recreate and then holding the keys that I have tested...it's not working for me. Is it a keybind that could be conflicting with another mod? It's not a keybind so it can't be conflicting. I don't know why it isn't working for you, it works fine for me. Will this work for servers? It won't right now because there is a crash a need to fix, but after I fix that it will work fine.